The United States has been under an illegal immigrant invasion for decades because our borders have been porous. Elected officials made deals with lobbyists who guaranteed cheap labor, amongst other deals. Now, there is a caravan of over 7,000 people moving through Mexico from Honduras, but this is not about jobs as they claim. They intend to arrive around midterm election day to create a spectacle, and the Democratic Party is complacent. The Left wants a humanitarian crisis that will make President Trump look bad by sending the National Guard to the border, but they are forgetting something. Immigration was the number one focal point of Trump’s campaign from the beginning. He captured many Americans’ attention with his promise of building a wall, using drones, more surveillance cameras, and increasing the number of Border Patrol and ICE agents. As this caravan moves through Mexico, Trump gets ammunition. His rallies for Republican candidates consistently draws more people than the venue can handle. More supporters get turned away from entry into the building than is in the caravan. Trump’s supporters have power through voting in November, unlike the left. For decades, the Republican Party capitulated and allowed illegal immigration. It took an outsider like Trump to step up and end their spineless immigration policies. Cheaper wages were more important than jobs for Americans. Now, the United States has a fighter who wants economic prosperity for all citizens, but the left does not. In the past, on rare occasions, when a Republican presented the idea of slowing down illegal aliens, they would be attacked, and back down from the concept. No other presidential candidate in 2016 would have fought like Trump. The caravan is Trump’s biggest showdown on illegal immigration. Earlier this year, he embarrassed Democrats by allowing them to shut down the government for illegal aliens, albeit less than a day. Now, a massive army of people is marching towards the United States daring Trump to do something. The object is to make Trump look heartless when it comes time to vote, but will that really work? Democrats are silent because they support open borders. Any illegal immigration is useful to the left. If Trump does not find a way to stop this, then the waves will continue and nothing will stop them. Trump could make the Democratic Party look bad, and call Congress back hold an emergency vote on the caravan. Left-wing politicians are silent because they do not want to aggravate the portion of their base that is anti-illegal immigration. The mob of illegal immigrants is not entitled to be here. No law says they must be accepted over economic hardships. The countries they are coming from already get United States foreign aid. It is their government that is mishandling the monies. Living in a country with a corrupt government does not mean that the illegals are entitled to live off of the American taxpayers. 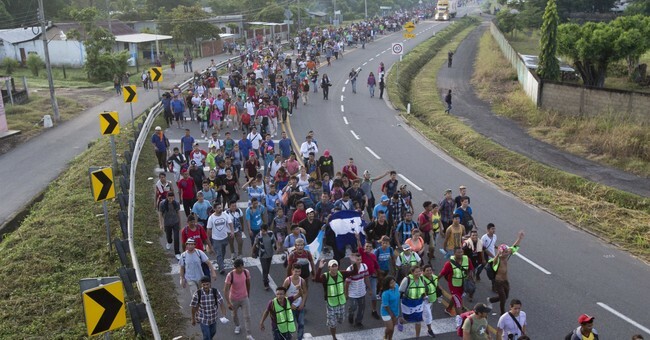 If the Democratic Party wins in the midterms, more Central Americans will be encouraged to come in massive waves to force their way in the country. American citizens have an important decision to make in November. They can vote for law and order, or they can vote to fund illegal aliens through government welfare programs.